Many online mega-retailers have discovered that 360 product images significantly boost product engagement and sales while reducing return rates. Unfortunately many shopping cart systems available to small and mid-sized businesses only allow static images be used on their product pages. Imajize solves this problem. Now you can easily embed a 360° product spin into any WordPress product page by simply pasting an embed link. 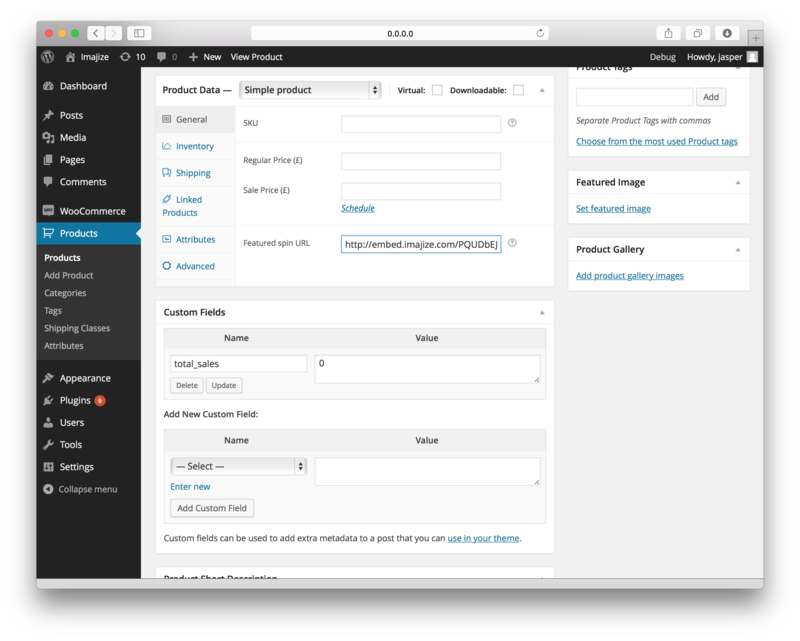 Install and activate the Imajize plugin on your wordpress website. Go to the WooCommerce product page you want to edit. Notice the handy new "Featured spin URL" field that we have added! Simply paste the embed code in "Featured spin URL" field and click save. That's it! Preview the product page to see it working.